Sweden is a wonderful destination for easy cycle touring. The main problem is knowing the best routes and getting enough information to plan to the trip in advance. 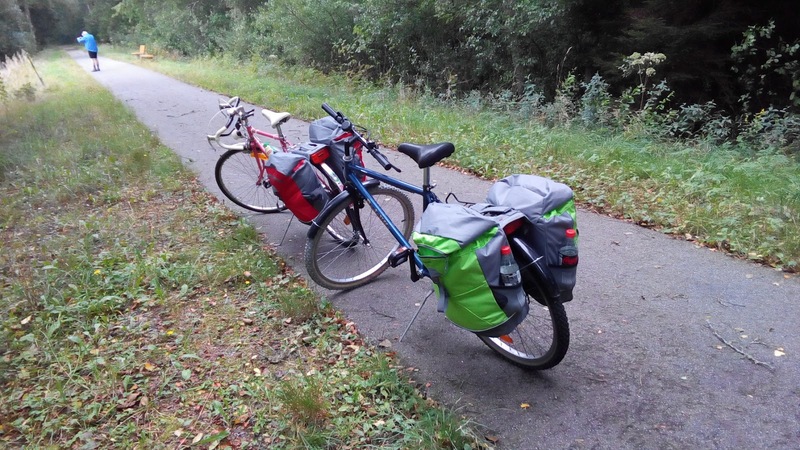 A few years ago we cycled part of the Gota Canal which was very pleasant, so this year I decided to plan another cycle touring trip to Sweden. After some Googling, I came across the Sjuharad Bike trail: http://cykelledensjuharadsrundan.se/en/. 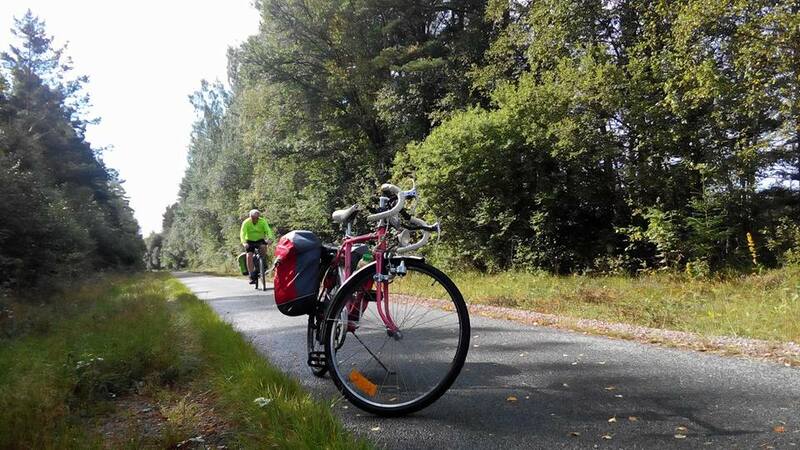 This is a circular route of 150km of generally well signposted mainly traffic free cycle paths. 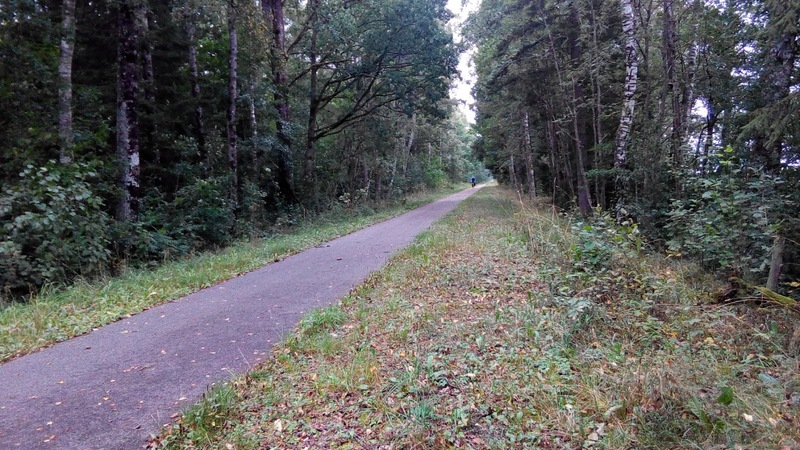 Most of it is on disused railway lines, through forests and around lakes, with a small part on minor roads. 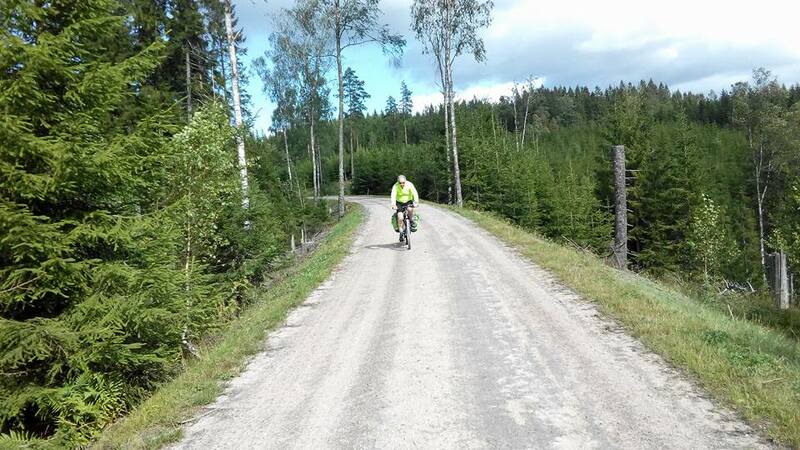 The above website gives you quite a bit of information about the bike trail itself, but it doesn't list accommodation or where to hire cycles. 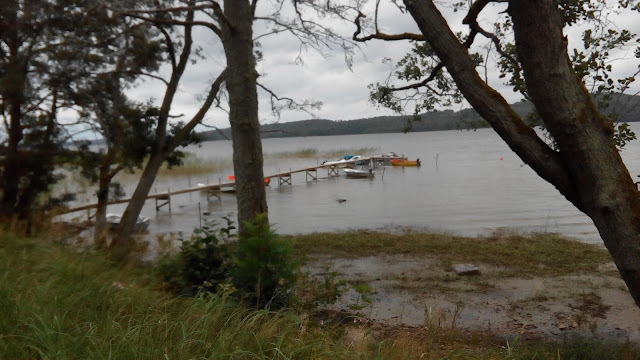 Fortunately in Sweden many campsites have stugas - cabins which are like micro-youth hostels - you just need to bring a hostel sheet and everything else is provided (cutlery, plates, cooking facilities, duvets etc). You normally have to clean the stuga afterwards and they provide you with a hoover and mop and bucket. As it can be difficult and expensive (although not impossible) to take bicycles on flights, the next thing we needed somewhere to hire bicycles. There is only one cycle hire place in Boras but they have a very wide selection of used bikes: mountain bikes, road bikes, hybrids, dutch style sit up and beg bikes. 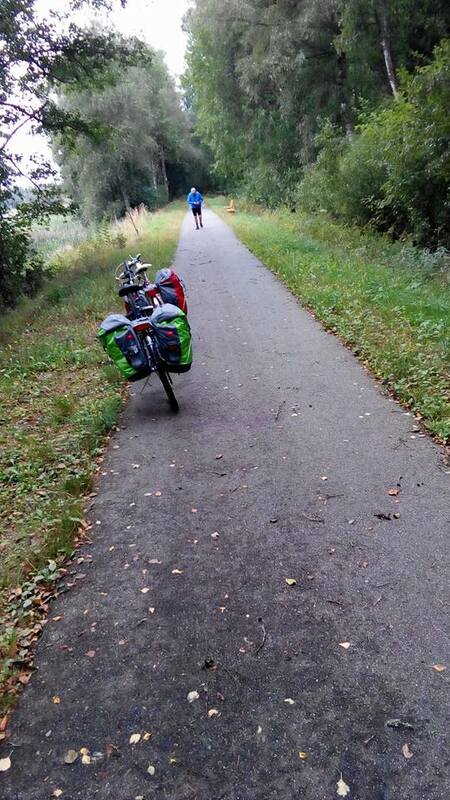 They don't hire panniers so we brought our own and selected bikes with rear racks. We found it was very important to choose bikes with working gears and brake before taking them (not all of the bikes were in a good state of repair). If I was doing this again I would also bring some basic tools, although the bikes we chose were very well behaved on the tour so we were fine. I chose a 6-speed road bike (2-speed derailier and a 3-speed hub), probably dating from the 1970s or 80s. There are few uphill sections on this trail so the limited gearing wasn't too important. This old bike really grew on me during the trip and I was sad to part of it at the end. Centre pull brakes and "safety" brake levers - so iconic. After finishing the Sjuharad cycle trail we caught the train back to Gothenburg and spent a few days sightseeing and visiting some of the nearby islands. A great way to finish the holiday. You can get a City Card that covers buses, trams and ferries as well as providing free entrance to many museums. To the ancient Greeks and Romans, dog days corresponded to the period in late summer when Sirius was visible above the horizon. They believed that dog days were an unhealthy time of year, a time of heat, humidity, fever, and even war and disaster. This year, I've spent part of the dog days in clearing out old papers that accumulate in cupboards and filing cabinets because I've never had the time or inclination to go through them. I've also been giving away various pieces of furniture and kit I no longer use (with the help of Freegle and Streetlife). Perhaps there is a metaphor here. Our ideas and attitudes can become more cluttered as we get older to the extent that they can clog up our outlook on life. If we suddenly we decide to just let useless things go, will we see the world more clearly? Perhaps. It is a while since I stayed up until the small hours of the morning just to finish a book, but I did last night. I was reading Uma & Imp, a children's novel by Larisa Villar Hauser. Uma & Imp is a rollicking mystery adventure story. The plot revolves around 11-year-old Uma's search for her parents who vanished in mysterious circumstances when she was four. Uma finds a clue to their disappearance hidden in an old photograph and is soon searching for an elusive Prof Harris. Unfortunately she quickly discovers that she is not the only one seeking him. Aided, abetted and hindered in turn by the irrepressible Imp, Uma eventually locates Harris only to find sinister characters, El Jefe, Barrel and Stick are in hot pursuit. As the story unfolds we are riding a speeding rollercoaster of a plot which just gets faster and faster. The various twists, turns and narrow escapes are interspersed with humorous episodes involving either Imp or dotty Aunt Callista, making it a fun read as well as a cracking page-turner. My favourite character is the puckish Imp who is plays the role of both mentor and mischief-maker to the more serious Uma. I just hope there is a sequel as I'm really starting to miss Imp. Should appeal to children aged anywhere between 9 and 90. I've given it 5 stars and it has made it into my Top 100 children's books. My varied interests include: reading and writing children's fiction, walking, cycling, camping, theatre, old clocks and watches, gardens, historic houses, disused railways, steam trains, genealogy, travel, myths and legends, and finding out about anything that catches my interest. I have degrees in physics and statistics and am currently studying for an MA in Writing for Children. My knee was replaced a couple of years ago and I am currently being treated for breast cancer. Who might be interested in this blog?